Kim Krattley has been named one of ve Phillips Scholars for 2018. Sophomore Kim Krattley has been named one of this year’s Phillips Scholars, and the only one from Concordia. The Phillips Scholars program recognizes private college students with a passion for serving people with unmet needs in Minnesota communities. According to the Minnesota Private Colleges website, Phillips Scholars are selected to receive a $6,000 junior-year scholarship, a $4,000 summer award to design and implement a major service project, $500 from the project resource funding and a $6,000 senior-year scholarship contingent on the successful completion of the summer project. Krattley’s project, in collaboration with the admissions office, is creating a website to help first-generation college students with the college application process and succeeding in college. Krattley is double-majoring in healthcare administration and German. Her project fulfills this year’s Phillips Scholars theme, and also has a personal connection. Concordia Minister for Faith and Spirituality in Action Jon Leiseth helps guide students interested in the Phillips Scholars program with the application process. “Eligible colleges are allowed to nominate up to two students for consideration by a Phillips selection committee. I work with students to clarify their project ideas and to put together the strongest applications possible. I also work with a Concordia committee who reviews the Concordia applications and makes the final recommendation as to whether we will move forward no, one or two applications,” he said. Krattley was chosen to move forward and was ultimately named one of five Minnesota students to receive the award. That was when she contacted the admissions office to begin their collaboration. Sunet Rubalcava, a Concordia admissions representative, instantly connected with Krattley. 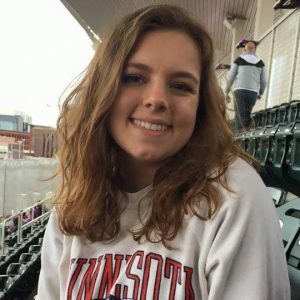 “When I met Kim I was really excited to connect with another student who is also involved in issues of inclusion and social justice. I invited her for an additional meeting with Rachel Michaud, another admission representative who was going to present a research proposal seeking effective ways to best serve first generation/people of color/LGBTQA+ from an admission perspective. It was a perfect match,” she said. While the project is still in its early development stages, Krattley has been enjoying the partnership as well. “It led to me joining this ‘Dream Team.’ In the Diversity survey that was just sent out, we included some questions, and we hope to have a focus group within the next few weeks. We’ll talk about the Concordia admissions process, what’s good, what’s bad. Hopefully I’ll be able to provide College Connected as a resource for the admissions representatives as well,” she said. Overall, the process has been challenging but exciting for both Krattley and Rubalcava. “My favorite part about this project is working closely with our students. It is very refreshing and inspiring. We have some of the most resilient and amazing students I have ever met. Kim is definitely one of them,” Rubalcava said. For those who are on the fence about applying for a highly selective program or award, such as the Phillips Scholars program, Krattley has some advice. “Go for it. It is an extensive process, but it is well worth it, because not only am I more connected on campus, but also this project is something that I’ll be working on for the rest of my time here at Concordia. I’d definitely recommend it, not only is there amazing financial benefits, and also it’s a way for you to connect with students. If you think it’s possible, then go for it,” she said.